Dying Easter eggs is an age old traditions that children all over will take part in during the Easter season. It’s such a fun activity to do. Who wouldn’t love to dip eggs into dye and watch them turn into gorgeous colors? I grew up using store bought dyes and for a few years my kids have used store bought dyes as well. This year, we made the switch to naturally dyed Easter Eggs and loved it! Why switch to naturally dyed Easter eggs? Easter happens in the spring and why not incorporate springtime and nature into the holiday? Using ingredients you find in nature to make your dyes is a great way to keep things fresh and natural. Artificial dyes have a lot of health concerns such as behavior issues and hyperactivity. Now if you aren’t going to eat your Easter eggs than artificial dyes probably aren’t too big of a concern (outside of the fact that you are supporting their making and I imagine there are lots of concerns just with the process of making artificial dyes). 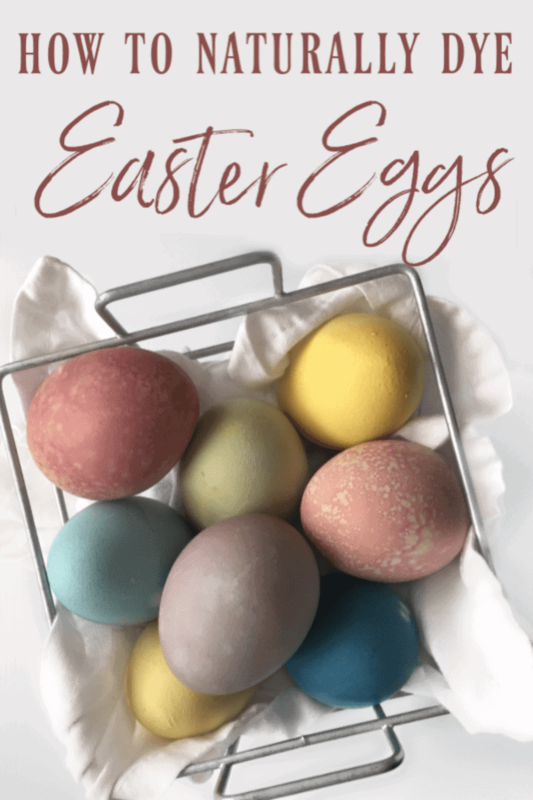 However if you ARE going to eat your Easter eggs, then you’ll want to skip the artificial dyes because they actually can creep through the shells and contaminate your lovely eggs. In a small pot, bring 2 cups of water plus ingredient for desired color to a boil. Transfer dye to a jar (mason jars work great). You will have a bit over 1 cup of dye. Carefully add an egg or two to the dye. Once eggs are to your desired color, carefully pat dry. Do not rub as the dye may wipe off. I thought about trying to find natural dye ingredients for these colors and I tried a few but honestly, I like simple! So I made the 3 primary colors and then I did the classic making secondary color technique. Green – Dye eggs in yellow. Remove and let dry then dip in the blue until you get your desired green shade. Orange – Dye eggs in yellow. Remove and let dry then dip in the red until you get your desired green shade. Purple – Dye eggs in red. Remove and let dry then dip in the blue until you get your desired green shade. What a great alternative for those who don’t keep food dye in their home! Thanks for linking to the Homestead Blog Hop! The colors are so vibrant and pretty for naturally dyed! Thank you for the fun project – my girls will love this! These are great! I was looking for a simple natural egg dyes and this is perfect! Thanks! !